I sat down in our thick velvet olive sofas as Marion, my French New York-imported friend, started to share with me everything she learned at an English Manners lesson in London. 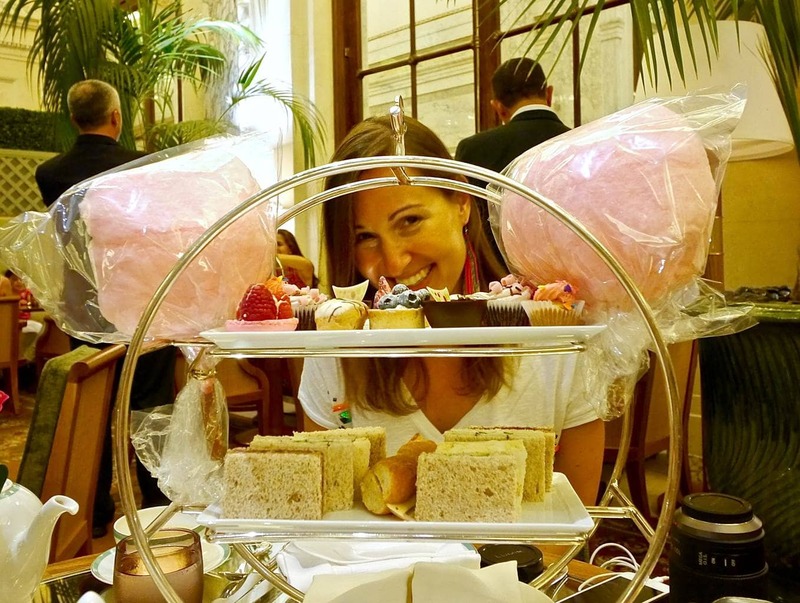 “You should eat the sandwiches before the scones and cakes,” she insisted as I ogled the absolutely beautiful and delicate pink cupcakes and pastries, threatening to eat them straightaway. The finger sandwiches felt like the vegetables one needs to eat before being able to attack the dessert, although they were as delicious. We booked High Tea at the Plaza the afternoon before, in a rush, while walking along Fifth Avenue and onto Central Park. As we returned the day after, on a sunny warm Sunday afternoon at the end of summer, the imposing opulence of the Palm Court was fascinating. The Plaza re-opened in 2008, after a billion dollar renovation, under the management of Fairmont Hotels. 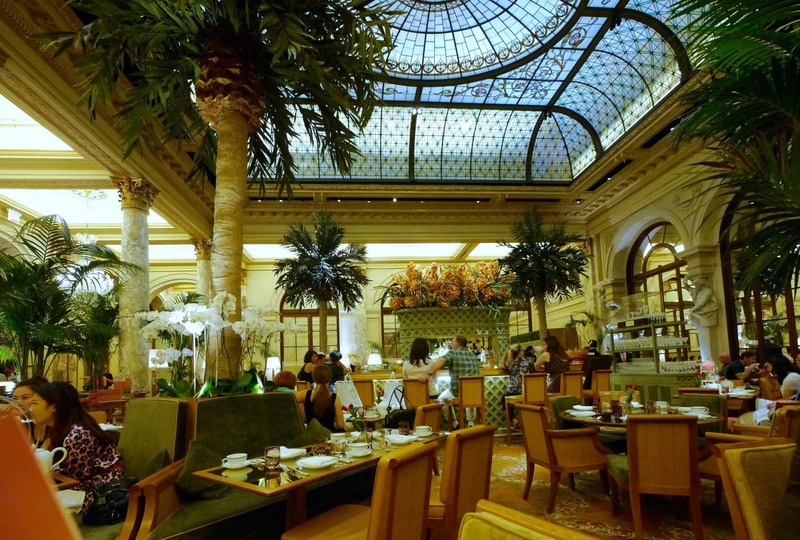 The most impressive part of the hotel is the stained glass dome in The Palm Court which was restored for showcase after fifty years. The decoration was made to feel like Central Park with four tall palm trees, large plant pots and pretty flower vases. The use of green and yellow contributed to the feeling of nature. 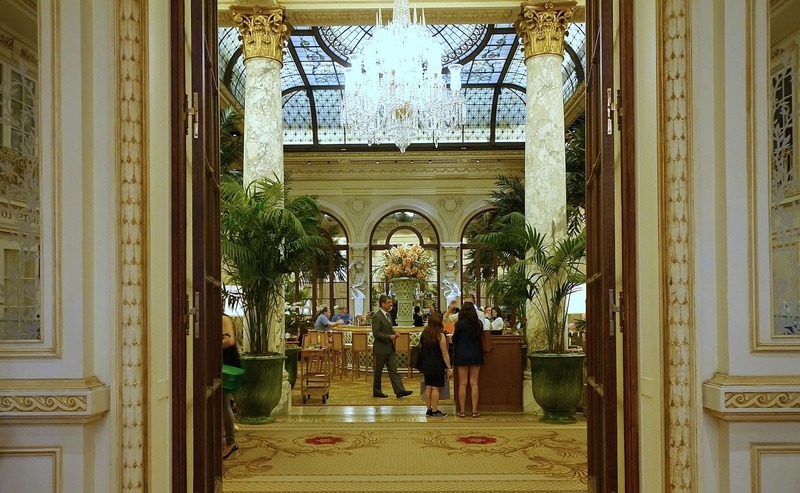 The Palm Court was the first room one finds through the main Fifth Avenue entrance and it provided an insight into the luxury of the entire hotel. 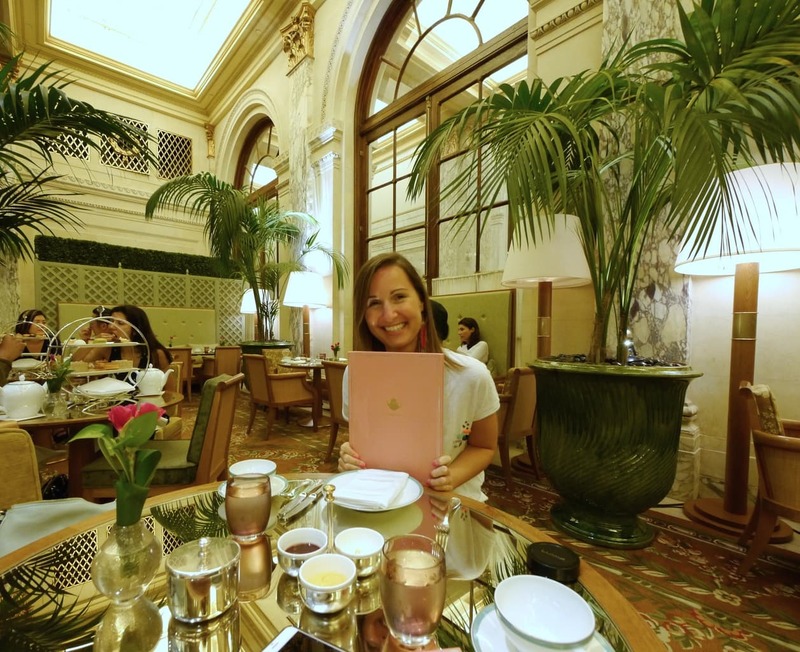 The Palm Court is not just the destination for those looking to pay tribute to good manners but also an all-day dining room that serves breakfast, lunch, dinner and drinks. Chef Geoffrey Zakarian offers American classics in the a la carte menu. The room underwent a two-month renovation at the end of 2014 and the new menus were revealed when it reopened. The space is compact but the constant use of mirrors and fine glass extends its size to the infinite. The tables are mirror topped so the dome reflects. Large crystal chandeliers hang from the ceiling and a circular bar dominates the room. The décor is glamorous yet simple, refined yet opulent. 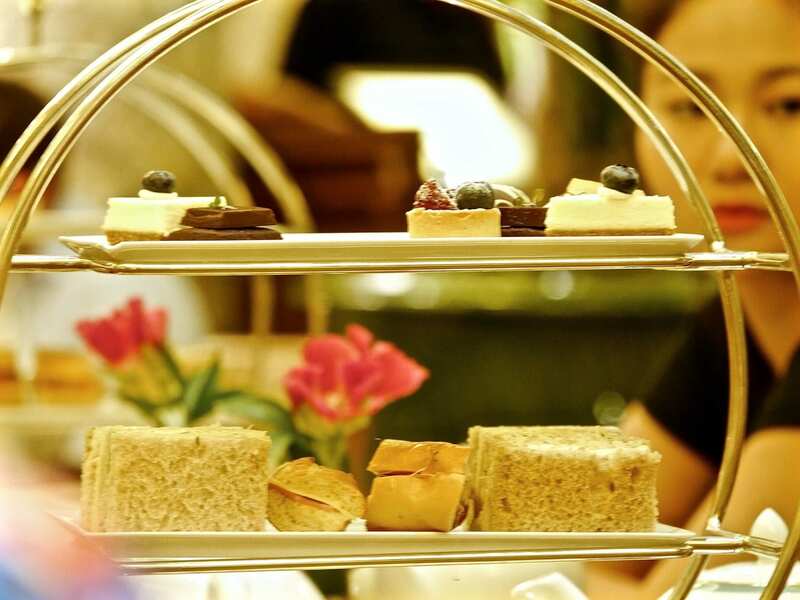 High Tea service was solemn and paid homage to British traditions with the three-layered stand and formal tableware and service. All silverware was branded. Plates and cups were made of fine china in white and light green. The jugs, cutlery and small bowls for the cream and jelly were heavy silver. The tea was decanted so the second cup tasted exactly like the first one, no bitterness. No detail had been spared in the presentation and surroundings to making this a service fit for the Queen. We walked in and were greeted by a Portuguese gentleman who recognized my Catalan name on the reservation and started to talk to me in my native language, something that had never happened before as my language is very rarely spoken by non-natives. He had lived in Barcelona and picked it up. It was a warm start to the sweet afternoon. He escorted us to our table, towards one side of the room. The menu started with cocktails and drinks and was followed by the three High Tea menus. The cocktail list included all the famous options. Cosmopolitan, Negroni, Margaritas, Gin & tonic, were all on offer, but with the special touch of The Plaza. The Tea menus reflected the hotel’s history and location. 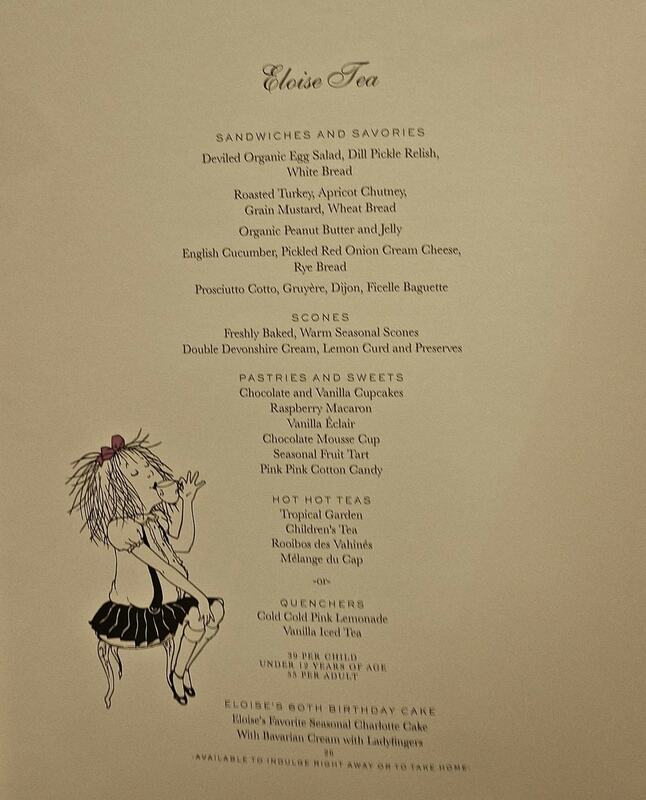 A luxury New Yorker menu included foie gras and caviar (optional) and in addition to the Classic menu, there was also The Eloise, designed for kids after the famous six year old character, yet the most popular choice judging by the orders of everyone around us. Aside from the long list of alcoholic drinks and teas, guests could also enjoy freshly prepared lemonades. The tea list was worldly but not excessive with leaves from India to China, Korea to South Africa. Marion recognized the Palais du The touch in some of the teas. There were green and black teas as well as oolong, herbals teas and red Rooibos. Some of the blends had a Grand Cuvee supplement of up to $20. A steep price for a pot of tea. The tea arrived first in large pots resting on yellow cards with the tasting notes. The three-layer indulgence arrived shortly after. Scones and sandwiches were inverted to allocate the primary top observation deck to the pretty sweets. So much detail and care had gone into creating the sweets that I felt the sandwiches had been, perhaps, neglected. The cucumber sandwich was thick with a generous layer of cream cheese. Peanut butter and jelly should have been toasted as the whole meal bread it was served into made the flavors of the nut and the fruit get lost in the cereal. The mini baguette with ham and cheese should have been made to order as the bread was chewy and the cheese sweaty. The egg and turkey sandwiches were good. The real delicacies came in the sweet department. The scones were fabulous, easy to open with the twist of a hand, and the lemon curd was deliciously creamy and fruity. The clotted cream was a dangerous heart rate increasing dollop of goodness. The cakes shone most. Because we had The Eloise, almost all of the pastries had pink on them. The amount of detail and love that had gone into creating the pretty mini cupcakes was astonishing. The pink one had small sugar hearts sprinkled on top. The tiny fruit tarts were made with the most delicious fresh fruits and a thin tart base. The chocolate mousse was exquisitely rich and the eclaire was filled fat with a thick cream. They were the star of the afternoon. The service was friendly and dedicated and the atmosphere called for a special occasion, although prices were affordable. The Eloise was $55 per person, a reasonable amount given the time and effort put into each creation. High Tea is served from 12,30 to 4,30pm so one could almost come for lunch. When in town, this is a fabulous way to pay homage to New York’s longest standing hotel while indulging a sweet tooth.